Rent Ruggles Green River Oaks | Corporate Events | Wedding Locations, Event Spaces and Party Venues. Ruggles Green, locally owned and operated, serves local, all-natural, and often organic menu items, specializes in gluten-free and vegetarian options all in a family-friendly atmosphere. We offer fresh salads, sandwiches, burgers, tacos, pizzas and pastas, as well as organic and iodynamic wine and beer. With 4 locations in and around the Houston Area, Ruggles Green is expected to showcase the greenest restaurant in the United States by year end. The newest location in the Heights uses 100% renewable energy powered, has a 2.5kW solar array (solar powered), uses 100% energy-efficient LED lighting inside and out, and provides a free electric car charging in the parking lot. Ruggles Green reduces its overall impact to the environment with waste (recycling) and water reduction procedures. We work with the Green Restaurant Association, (GRA) dinegreen.com to validate our green certifications. 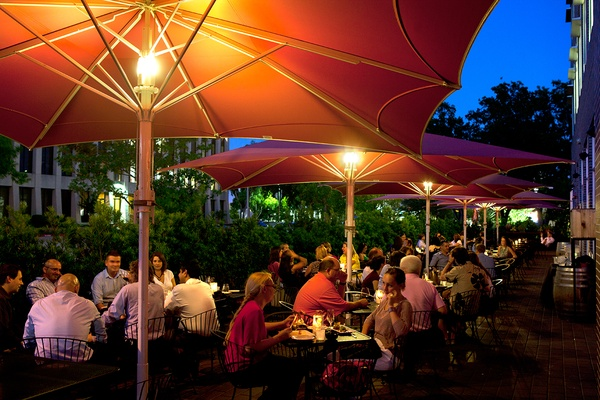 Formed in late 2008, Ruggles Green is Houston’s first Certified Green Restaurantâ„¢. Ruggles Green adheres to the strict guidelines of the Green Restaurant Association. Ruggles Green is a premium fast casual restaurant with no waiters, no valets, and no hassles. Just great food that is good for you. This restaurant features original, delicious menu items; such as the 98% Lean Buffalo Burger, the Wood-Fired Quinoa Mac & Cheese and the very tasty Veggie-Nut Hemp Burger. They also offer Wood-fired Organic Pizzas that are Heavenly! Â Committed to Houston health food and a healthy environment too, join Ruggles Green for tasty, organic foods and wines.